It's been a relatively quiet week in terms of new camera releases, but never fear we've been busy working on reviews, features and industry news to keep you up to date with the latest goings on. Read on for our round-up of everything that's been happening this week, each with links to the full story. It feels like the week in camera news wouldn't be complete with the latest update from Olympus if the past few weeks are anything to go by. In this week's twist, ex-CEO Michael Woodford has been petitioned to return by an ex-Olympus employee. Excitement is now starting to build for the upcoming Fuji compact system camera the company announced it was working on a few weeks ago. Leaked (albeit blurry) images reveal that the camera bares a passing resemblance to a Leica M9, with some suggestions that the camera will use an 'organic' sensor. 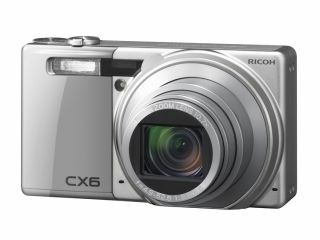 The only release this week is the Ricoh CX6, a 10 million pixel compact equipped with an impressive 10.7x optical zoom and quick AF system. Also packing a range of manual modes, such as aperture priority and shutter speed priority, the CX6 will be available from early December. Starting to think about making your Christmas lists? We'll have lots of gift suggestions coming up over the next few days and weeks, but in the meantime, check out our guide to the best Canon IXUS cameras, our guide to the best Canon Powershot models, discover the best tripods under £200 and see our ultimate guide to the best compact cameras on the market, with 27 reviewed and rated. Fresh from our in-depth test is the new a77, the new SLT camera from the manufacturer which features an electronic viewfinder that's really rather good. Take a look at our Sony Alpha a77 review now to see if you can be tempted away from your DSLR. This week we also got our hands on the all-new Panasonic compact system camera. While our full test is underway, check out our hands on Panasonic GX1 review which contains an introductory video and the testing data from our labs. To celebrate Manfrotto's Photo Lab, which is running this weekend, we have a tripod and bag to give away. All you need to do is 'Like' our Facebook page and once we hit 2,000 members we'll pick a winner... don't say we never give you anything. That's all for this week, join us again next week for all the latest news, and don't forget you can contact us via our Twitter and Facebook pages too.